Ladybug's Flowers & Gifts Inc is family owned and operated. With three generations of experience we are committed to offering only the finest floral designs. As a Certified Georgia Master Florist, our designers take pride in creating unique and individual floral arrangements. We specialize in fresh flowers, permanent botanicals, and gifts for all occasions. We are dedicated to accenting your life with flowers and gifts. You can place your order on the web 24 hours a day or call us for personal customer service. You will find a Ladybug on each floral design that leaves our design room. This means that your floral design has been inspected and approved by our design team. 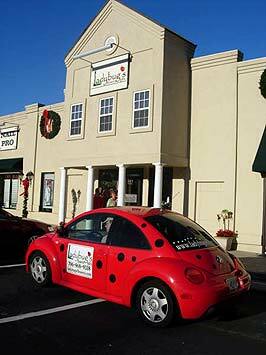 Our customers know to look for the Ladybug when they receive flowers because they know we take pride in all of our products. Thanks to our customers for voting us the "Best Florist in Columbia County and Metro Augusta for 2008, 2009, 2010, 2011, 2012, 2013, 2014 and 2015 by Columbia County Magazine! Thanks CSRA for voting us "Best Floral Shop 2010" in the Augusta Metro Spirit. Voted "Best Florist" by readers of Applause in 2010. Make sure to watch the Extreme Makeover Home Edition - Augusta, GA - we designed all of the floral designs for the home. Columbia County Chamber Small Business of the Year in 2013. *Our shop is open from 9:00 a.m. to 5:00 p.m., Monday through Friday and from 9:00 a.m. to12:00 p.m. on Saturday. Our commitment to you is 100% satisfaction on all your floral and gift purchases. If you are not completely satisfied, let us know by calling (706) 868-9318. We have a 24 hour cancellation policy. Each order is custom made to order and will not be refunded without a 24 hour cancellation notice. We have a 48 hour change and cancellation policy for prom orders. No changes to orders or cancellations will be accepted 48 hours before pick up date. Our shop serves the following areas: North Augusta, Augusta, Martinez, Evans, Grovetown, Hephzibah. If you have any questions or need more information,email us at ladybugsflorist@bellsouth.net or call us directly at (866) 397-9318 toll free or (706) 868-9318 locally. We're always here to serve you and make your flower-sending experience a pleasure. We do have a 24 hour cancellation policy. Each order is custom made to order and will not be refunded without a 24 hour cancellation notice. The gardens and plants you see on our website are an example of what we carry in the store. The gardens may contain a different variety of plants, but will be of the same size and value.